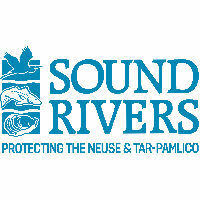 Sound Rivers is a private nonprofit organization that guards the health and natural beauty of the Neuse and Tar-Pamlico River Basins. We partner with concerned citizens to monitor, protect, restore and preserve the watersheds covering 23% of North Carolina’s land mass. Our goal is to provide clean water to our communities for consumption, recreation, nature preservation and agricultural use. Founded in 2015 with the merger of two of the state’s oldest grassroots conservation organizations, Sound Rivers combines the deep history of advocacy of the Neuse River Foundation, established in 1980, and the Pamlico-Tar River Foundation, established in 1981. This union to become Sound Rivers creates a powerful advocate protecting our most cherished waterways and bolsters our impact within the State of North Carolina. Our three full-time Riverkeepers® monitor and protect the Neuse and Tar-Pamlico River Basins, serving as scientific experts and educational resources to schools and communities in the watershed.